FREE DOWNLOAD: Elearning ROI Calculator. Plug in your numbers and let our automatic calculations show your possible elearning savings and ROI! It’s confirmed: analytics are going to be a crucial part of corporate training going forward. It’s like all the executives held a secret corporate-training conference and decided that they all want data. And they want it now. Elearning ROI is one of the biggest data points that people want. If they’re going to invest in training, there needs to be a payoff for that training. It’s a difficult thing to wrap your head around in a field that people often get into because they’re passionate about professional development and growing employees into the best they can be. How can you place a monetary value on people growing and learning? This can be especially frustrating if the data comes back and you or your boss aren’t satisfied with the numbers. The numbers can be low even if the quality of the training is high. Here are some areas of training to look at to help you determine a strategy for tackling the ROI report with the goal of improving future numbers. It all starts with making sure you have the right tool(s). Buying sophisticated LMS software or learning tools for a relatively small company with limited training needs is going to make your elearning more expensive than the payoff. However, trying to pull detailed data for a large organization with complex business and training needs is nearly impossible for a simplified LMS. Many times, the reports and data you need just don’t exist in these systems. For example, our eSSential LMS is a sophisticated LMS. It’s a great tool for organizations who have multi-person learning and development or training teams as well as larger user bases. Small organizations with just one LMS admin are unlikely to have the time and resources to get the full benefit of or utilize all the features of eSSential LMS. By being realistic with who we serve, we’ve been able to create happier clients and build complimentary feature sets that benefit their needs. In the same way, you should be realistic with yourself about what your company needs and then go find the tools that will suit those needs. This will keep you from making poor budgeting decisions that throw off your elearning ROI data and muddy up how well the training benefits employees. We know that your content is important and useful in making employees be the best they can be, but do your employees know that? It may be time to grapple with the level of engagement learners have with your courses. Check out some other metrics: are they finishing the courses? In how much time? Do they like the training, or do they see it as an annoying obligation? Is the visual look of your course interesting, modern, and easy to follow? Have you considered using gamification or progress bars? Is there a social element to the way users are learning? Are there ways you can better convey how the information in the course will benefit learners? Do organizational leaders demonstrate the importance of learning through their actions? Is the course available and easy to use on multiple platforms? While this isn’t an exhaustive list of engagement indicators, it can help you on the path toward finding areas that may need some improvement. ROI can be more complicated than it seems. How do you put a number on the elearning ROI of something like learner motivation and happiness? The ROI of higher customer satisfaction? And, in a more logistical sense, those mathematical calculations can be difficult. Don’t be afraid to consult with the people who are experts at performing that kind of math: your company’s accounting department. Let them help you put together the formulas and pull the numbers that make sense to so you can present accurate numbers to executives. One of the biggest, fast-growing methods companies are using to increase learner knowledge retention is continuous learning. The Ebbinghaus Forgetting Curve tells us that information recall drops steeply within a few days of the course. Continuous learning is a way to combat that and make sure learners retain information. Learners who retain information are more likely to consistently apply it and produce results for the company – therefore creating positive elearning ROI. Follow up the course with on-the-job training and meetings with mentors to check in and give an opportunity to ask questions. Provide opportunities for social learning and for workers to seek help from each other when applying the new training. Space out the learning over time. Instead of quizzing them once, have leaners renew their quiz scores every week or every few weeks to refresh the material and reinforce it in their brains. Microlearning can make it easy to fit in modules over time and continually revisit topics. An eLogic client switched from quarterly paper-based safety training to monthly microlearning modules, which has had better completion rates and effectiveness. It’s also worth checking into whether the learning method(s) is effective for retaining knowledge in the first place. For example, Kevin Thorn of NuggetHead Studios discovered that comics are more effective than other training methods at increasing knowledge retention. Last but not least, reevaluate whether the measurements you’re taking align with your goals. If your company wants to improve customer satisfaction but you’re only tracking course completions then you only getting a small piece of the ROI picture and not enough to get a clear indication on whether or not customer satisfaction is improving. Instead, you should be tracking course completions, the time it took to complete the course, results from surveys around customer satisfaction, whether they completed multiple courses (if applicable), and much more. It’s much better to come up with these metrics to measure as you begin outlining your course(s). That way, you can build the course and/or report with those data deliverables in mind. How will the course objectives align with company goals? How will I measure the relationship between those two things? Data can be an important tool for your company to ensure that training goals are met. It’s easy to get overwhelmed by thinking about big data in a complex sense. So it might be more helpful to narrow it down and think about what you want your training to do in relationship to the rest of the company and its goals. Hopefully, it won’t take too many adjustments for your training to start reflecting sky-high elearning ROI. You’ll be showing executives the importance of continuing to invest in a department that is proving to be a crucial part of continued organization success in no time! 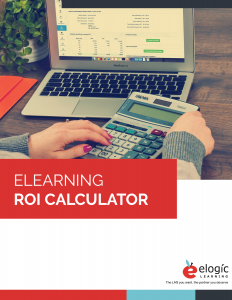 This excel calculator lets you plug in all the numbers and determine elearning ROI. No need to do any math – we’ve done the hard work for you in putting together all the algorithms.